Governor Babatunde Fashola, of Lagos State is bereaved. 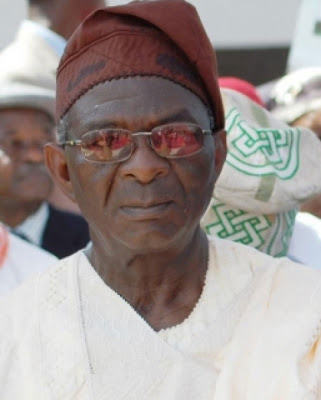 Fashola’s aged father, Alhaji Ademola Fashola is dead. He passed away in the wee hours of Monday August 5, 2013 in Lagos at age 79. While preparing for his 80th birthday that is to come up in September, Alhaji Ademola Fashola contracted an age related illness. He was airlifted to the US for treatment later to return home to end his journey on earth. As we speak, his son, Governor Fashola is on holy pilgrimage to Mecca. He is expected to return to the country for his father’s burial on Tuesday. Late Ademola Fashola was a staff of the defunct Daily Times newspaper before his retirement. His burial will take place tomorrow afternoon at the Vaults and Gardens burial ground in Ikoyi Lagos at 1p.m. Pa Fashola is survived by many children, grand children and great-grand children. Great Daddy! we loved you, perharps, God does more than we do, Rest In Perfect Peace!!! To the great political Icon and the Boss of Lagos State, take heart, God has reason for this sudden departure. R.I.P Baba..! We wud meet again in d bossom of God..sleep wel baba..! Sun re o baba, R.I.P. my sincere condolence to the family of Fasola…. Baba May your soul rest in peace. the great pacesetter, gov fashola, take heart.